You are here: Home / EU - Regulating Biking / Shouting or Educating? 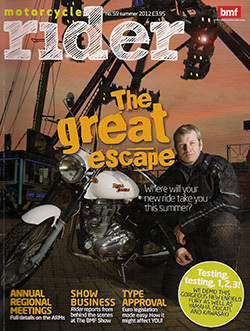 Over the weekend my BMF (British Motorcyclists Federation) members’ magazine – Motorcycle Rider – slipped through the letterbox. As soon as it was removed from its plastic wrapper I leafed through to the lobby section to read up on what the BMF’s political bod Chris Hodder was up to as regarding the EU Commission regulation proposal. Given the importance of the issue there was no surprise to find four full pages covering the Regulation proposal. The contents of the lobby section, are already published on the BMF website, including “The nuts and bolts of type approval” article which starts with: “Proposed changes to motorcycle type approval procedures have got a lot of attention from the press recently. But much of the debate has been based on false information and extreme interpretations. We set out to assess the facts.” and does just that. The article sets out some of the BMF concerns and opinions which are, “Namely over ABS and sweeping anti-tampering proposals, there are positive things in this legislation that we should welcome, such as CO2 measurement, universal access to repair and maintenance information and standardised diagnostic systems (i.e.) warning lights for failed components). Finally there is a question and answer section “How Will It Affect Me?” This looks at how the proposal will affect different riders of different styles of motorcycles from the Classic Bike Enthusiast to the Custom Bike Builder through to the Sportsbike Enthusiast, Adventurer Bike Rider and Touring Rider. This is also the crux of the proposed regulation which is to catch up on technical advances and innovations and to make sure that what innovations the manufacturers are offering riders, either as part of what they think riders need or what riders are asking for. This is in the context of the expectation that the next generation of motorcycles is technically capable, safe and of standardised conformity. Don’t mistake the use of the word “conformity” as meaning a “Euro Spec” bike that is bland and universally the same from each manufacturer. In this context conformity means that each model of motorcycle produced e.g. every Honda Fireblade sitting in a dealer’s showroom will be the same as it comes out of the box on performance, emissions and basically will not fall apart, at least not until the warranty period is over – but there’s a whole different discussion. Innovations and production of different types and styles from the manufacturers are not dead. Anyway back to the BMF. There is a certain “trend” on the Lobby pages with reference to lobbying MEPs, such as “Many MEPs are willing to help on this issue but if we want them to lobby on motorcycling’s behalf, we mustn’t muddy the water with spurious claims”. All of this legislation will only apply to new motorcycles produced after it comes into effect. It will have no impact at all on current or old bikes and will not affect the supply of parts, many of which are second hand anyway. Things such as ABS and restrictions on some tuning parts (not those used exclusively for racing) may be of concern for riders competing in stock motorcycle based championships and events. Obviously current bikes are unaffected and manufacturers may respond by having non-type-approved bikes for sale (racing specials) to fill the gap. The most noticeable difference may be that new bikes will have fuel consumption data published alongside them and even second-hand dealers will now have access to manufacturers’ data. Access to repair and maintenance information and standardised on-board diagnostics will mean that a wider range of bikes can be serviced and repaired by non-franchised workshops. Naturally, these bikes will also be more complicated, but this is the current trend anyway with traction control and·high-end ABS, for example. Most large touring bikes come with ABS anyway, so it’s unlikely you’ll notice a difference other than being able to compare manufacturers’ official fuel consumption figures with personal experience. One-off specials will still be built the existing way, either adapting existing bikes or getting ‘Single Vehicle Approval’ (SVA) for brand-new bikes. Malcolm Harbour told us: “At my initiative, to allow unique bikes to be exported into Europe, we are having discussions to embed existing EU rules on the mutual recognition of goods into this regulation for motorbikes to ensure, in particular, that UK SVA approvals are not blocked by authorities in other EU member states. “This could be a benefit for custom bike builders. New bikes will be fitted with ABS and some manufacturers will reserve the right to add a switch to turn it off for off tarmac riding. Fitting fog lights, crash bars and luggage racks will not be affected in any way. Mopeds will continue to have their speed restricted and, as now, you will not be allowed to tamper with them (as per your licence). The difference will be how easy it will or won’t be to continue to circumvent these restrictions. 125s and possibly the new category of A2 motorcycle (up to 48bhp) will also have some controls on them. More importantly, there is also a debate about how much the cost of ABS will add to a new bike. This needs clarification as current estimates seem widely speculative. Atermarket parts such as rear-sets, tail-tidies and the like, for the most part, will not be affected. There is a question over whether some more marginal parts would be allowed, such as air filters and exhausts, but at this stage it is assumed that they will be allowed. New bikes will, of course, have ABS, but as many new sportsbikes already have ABS this is not surprising. That then, is where we are at the time of writing, but in a constantly developing process, please check the BMF’s website for the latest position. The important thing to bear in mind is that this is the way the European Union does things. There’s no hidden agenda to curb motorcycling, it’s just that some politicians and some bureaucrats are so desperate to reduce motorcycle casualties that they come up with all sorts of odd ideas and it’s our job to put them right, not by shouting at them but by educating them. I don’t think that anybody in their right mind should trust a politician, but dialogue with them and civil servants is the best option, because it allows “them” to understand that there are different perspectives. I am perplexed as to your comment – “if we let this go on we will end up riding around on 3 wheel electric scooters limited to 50kph wearing the same regulation yellow vests”. What do you know that suggests that any regulation from the UNECE, or from the European Union or even from Westminster would allow “this” – whatever that is – to happen? Putting any trust in the politicians is a risky business – what they don’t get is that a motorcyclist makes a personal decision to trust their own skill set knowing that if they stuff up they will likely be injured or worse – no other road user makes the same level of personal commitment to their road skills – if we let this go on we will end up riding around on 3 wheel electric scooters limited to 50kph wearing the same regulation yellow vests… we will be forced to fly to Thailand or India to just ride a real bike again. Lets start a campaign to start licencing skiers and bungee jumpers …don’t they recklessly take their lives into their own hands, I think all downhill skiers should wear parachutes to slow them down in the event they panic…. just realised I am wasting energy here…but I feel just that little bit better for doing it.